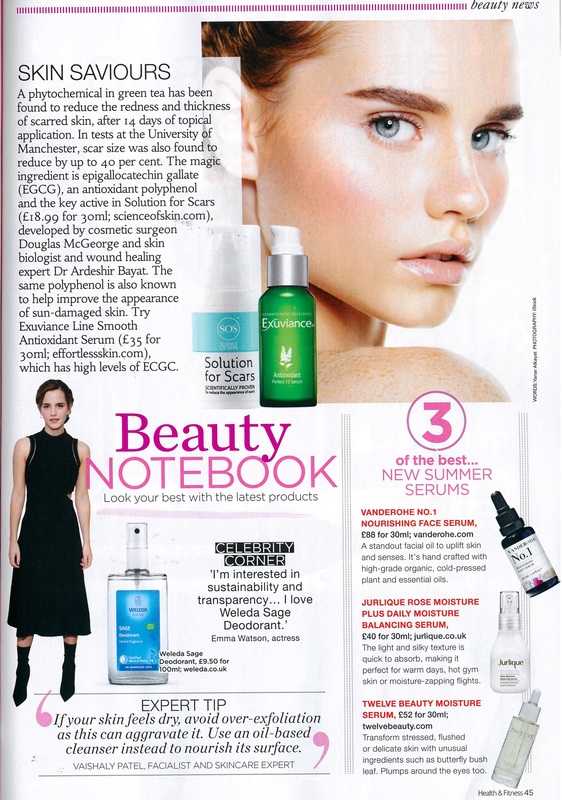 "I've seen great results since using this"
"Ultimately, people heal in different ways; it depends on the type and severity of scar, plus, age will play a factor." "If you only buy one thing this week..."
"After a month, it was incredible: you could hardly see it. Six weeks later, my daughter Francesca couldn’t even see it. Now I struggle to remember which side it’s on." 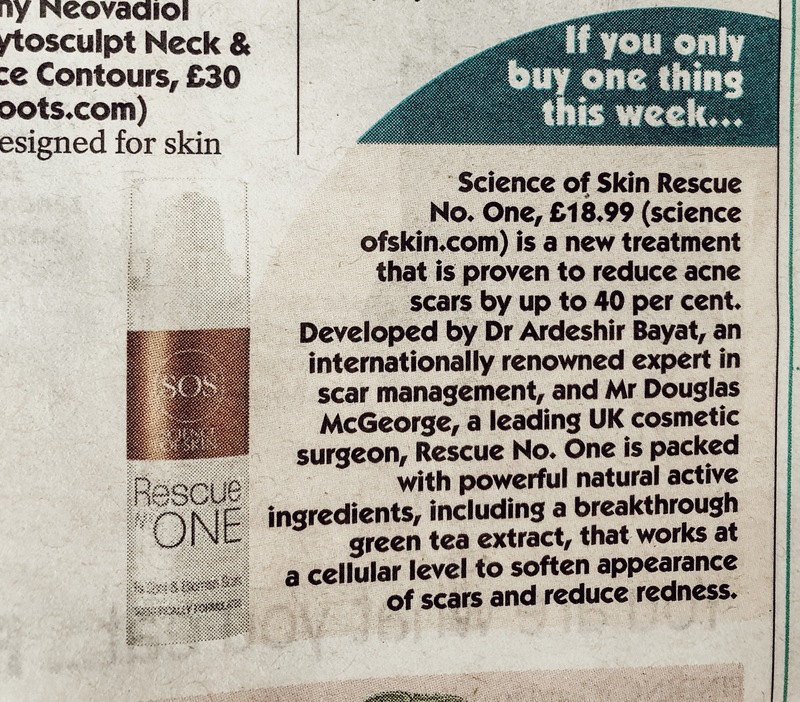 "infused with oils to nourish, smooth and protect and green tea extract to even out skin tone"
"We asked Douglas McGeorge, Founder of Science of Skin and one of the leading surgeons in the UK, all your caesarean scar-related questions"
"This hydrating, anti-stretch mark work to soothe and moisturise you and your bump"
"4 aftercare tips for new mums like the Duchess of Cambridge recovering from a third birth"
"New products for Mamas and Mamas-to-be"
"Been stalking this brand on social for ages so really excited to try them out"
"‘Stretch marks cream fit for a royal baby? 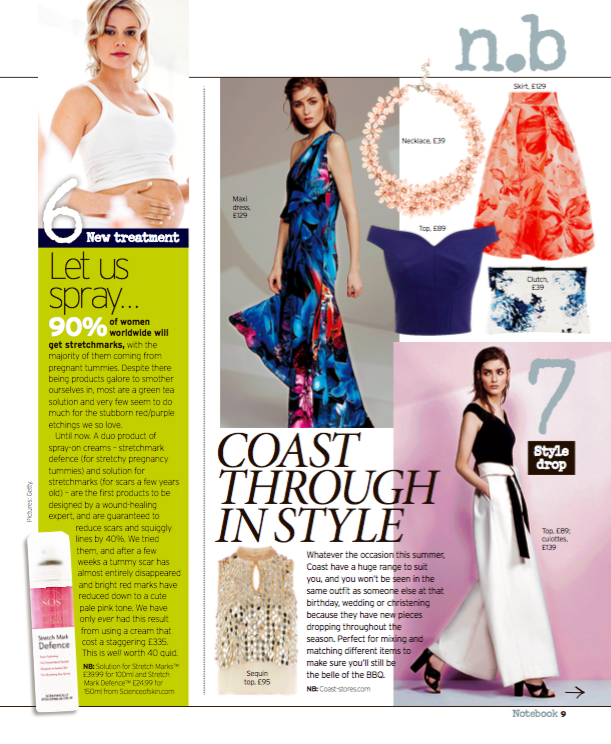 The £25 CURE to banish baby bump scars’." 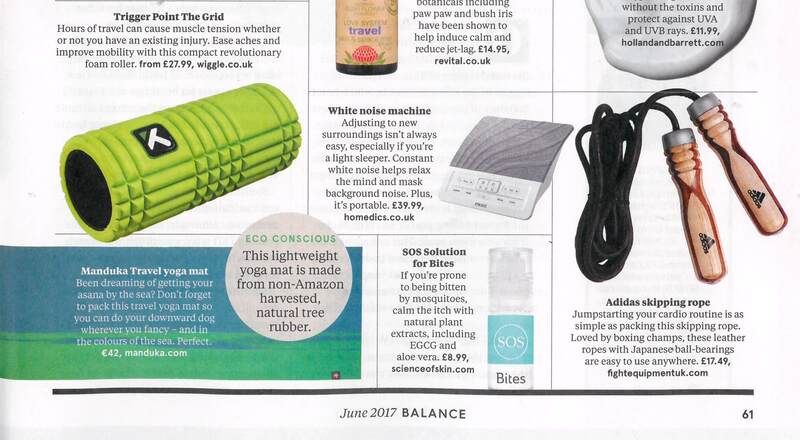 "With over 134 5* reviews this exciting invention has proved to reduce the appearance of scars"
"Q: My sister is about to have breast surgery (a lumpectomy) and I want to find something to help with the healing process. Is there anything you recommend? " 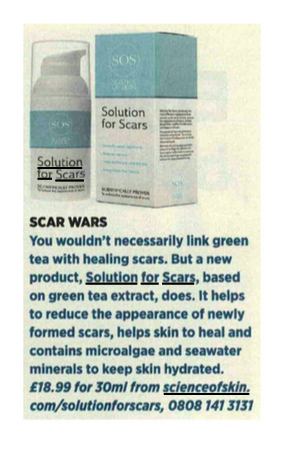 "Scar solutions. 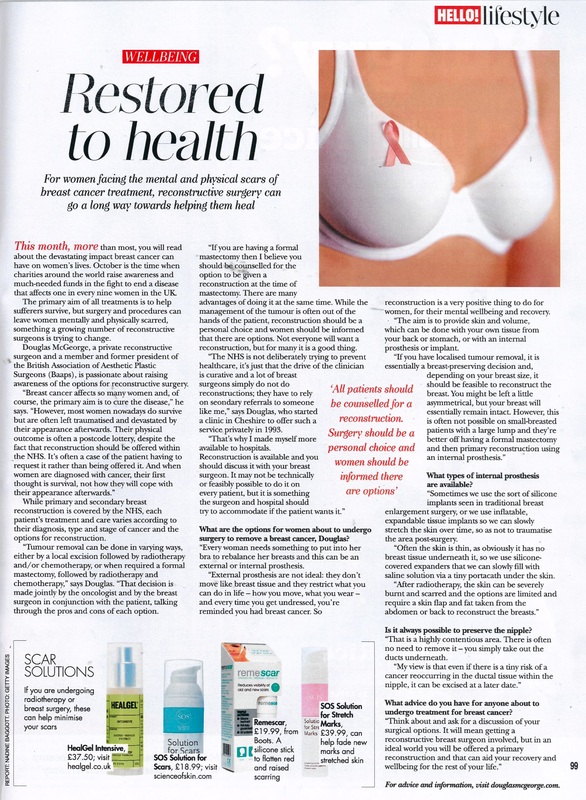 If you are undergoing radiotherapy or breast surgery, these can help minimise your scars." 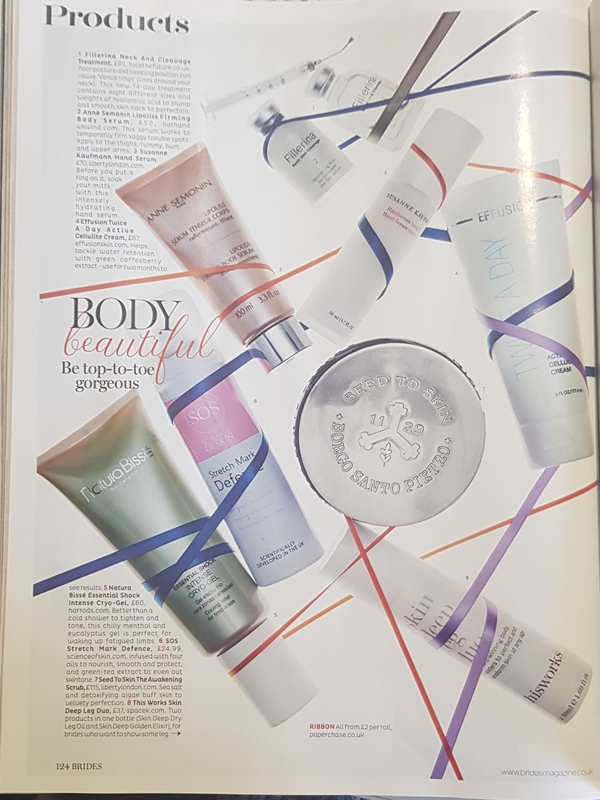 "Developed by a team of scarring experts, you might flinch at the price tag, but rest assured, this has been carefully developed taking the very best from science and nature. 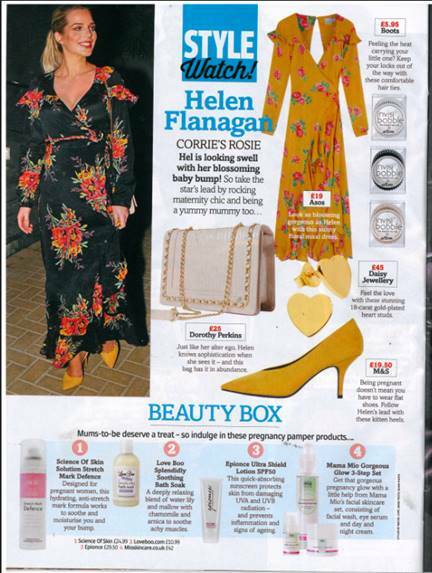 A great product if you’ve had a c-section, the cream contains a naturally active green tea extract that is said to shrink scars by 40%. " 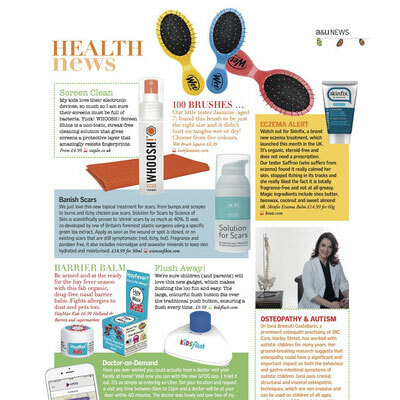 "This powerful pocket solution tackles bites fast, working with your skin’s own recovery processes.​ Combining effective, scientifically proven ingredients, it’s a fast-drying, no-mess formula in a small, handy rollerball applicator, which offers your family quick relief after being bitten." 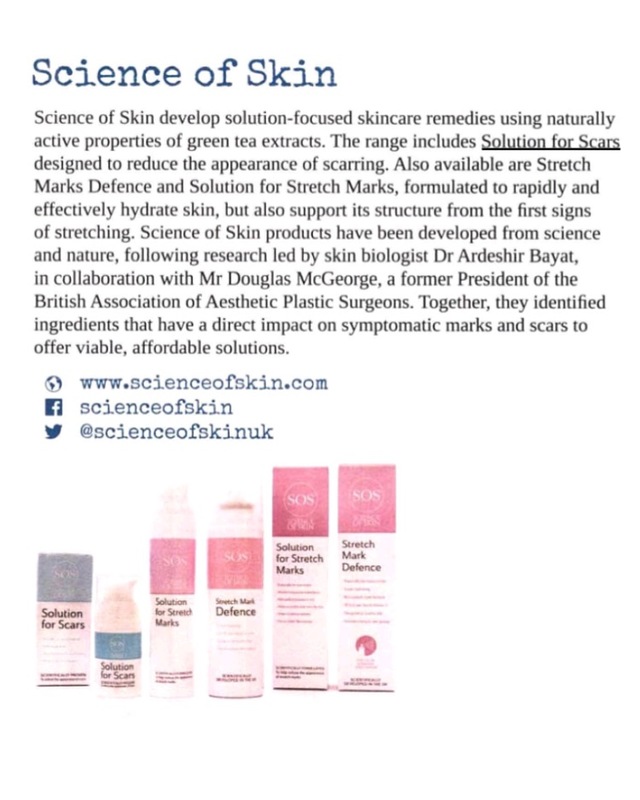 "Science of Skin's SOS Solution for Bites - the pocket-sized roll-on contains soothing extracts of green tea and aloe vera." "And WOW does it work…..instantly!" 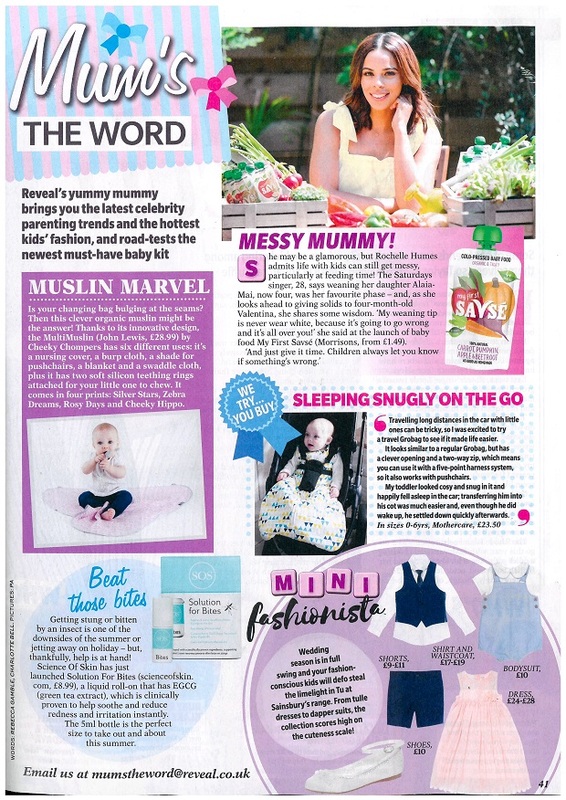 "Baby Shower Gift Guide for Mummy-To-Be & New Baby "
"Turning over a new leaf: How a cream containing green tea could help scars become less red, thick and itchy "
"If you are prone to being bitten by mosquitos, calm the itch with natural plant extracts, including EGCG and aloe vera"
"What I really like about this particular bottle is that it is a spray delivery system. 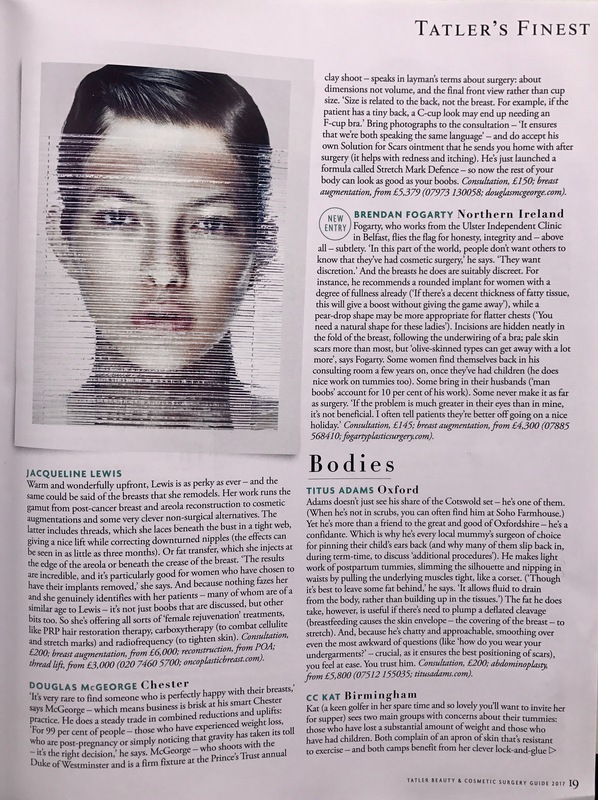 This means that there is no oily residue to contend with – unlike other products I have been using – as it’s quickly absorbed into the skin." 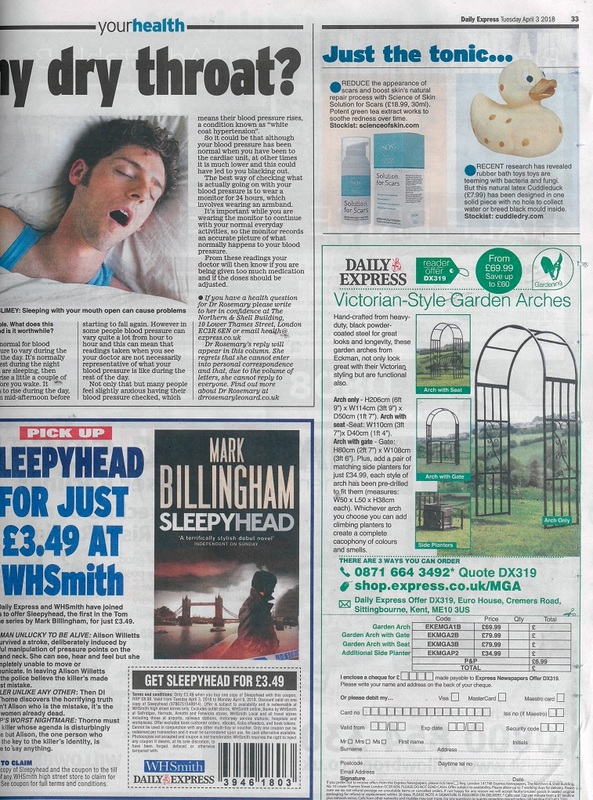 "I have been using the cream twice a day when I get out of the shower morning and night. It is not tacky and dries nicely on the skin so I can put my clothes on after application. 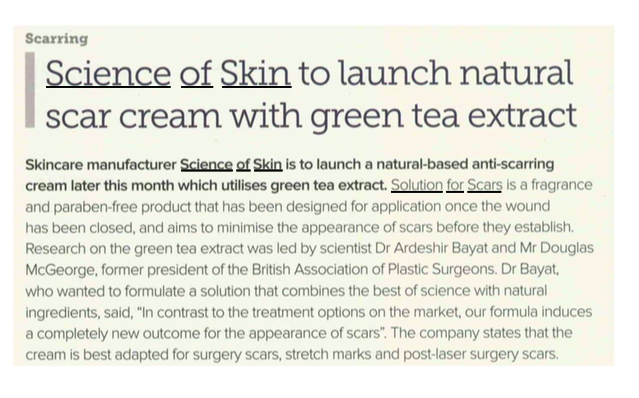 I have noticed the scar on my leg reduce in redness"
"A phytochemical in green tea has been found to reduce the redness and thickness of scarred skin after 14 days of topical application." 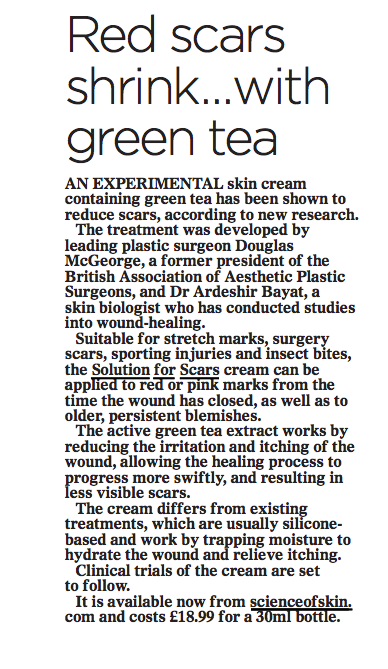 "Scar creams such as this act as a skin barrier, and green tea extract is a powerful anti-oxidant. 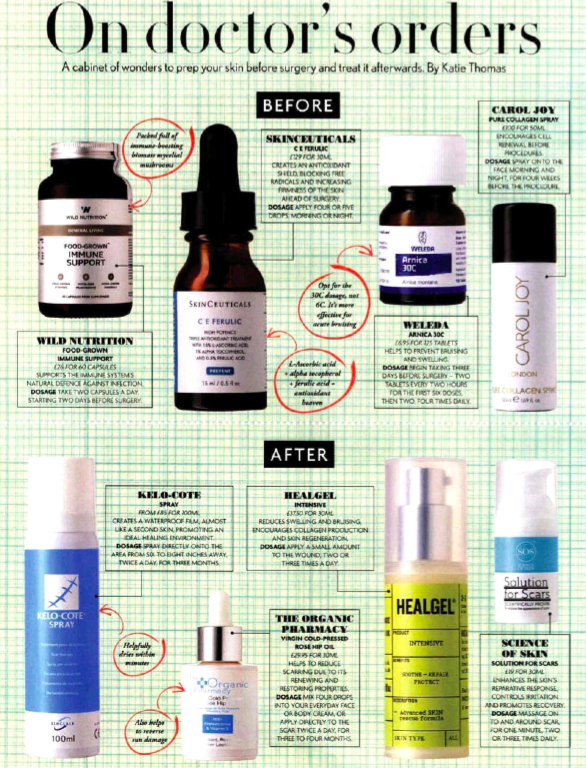 I applied this to an inflamed area of my own skin and the next morning it was completely settled." 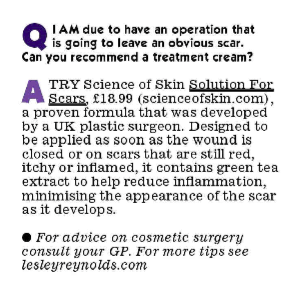 "Proven to significantly reduce the redness and thickness of a scar in just two weeks"
"Two top cosmetic surgeons have teamed up to develop a scar treatment cream which helped heal damaged skin tissue"
"Scar cream helped my daughter's skin heal"
"We asked a team of experts to explain the key issues that can affect expectant mothers, and share their advice to overcome them." 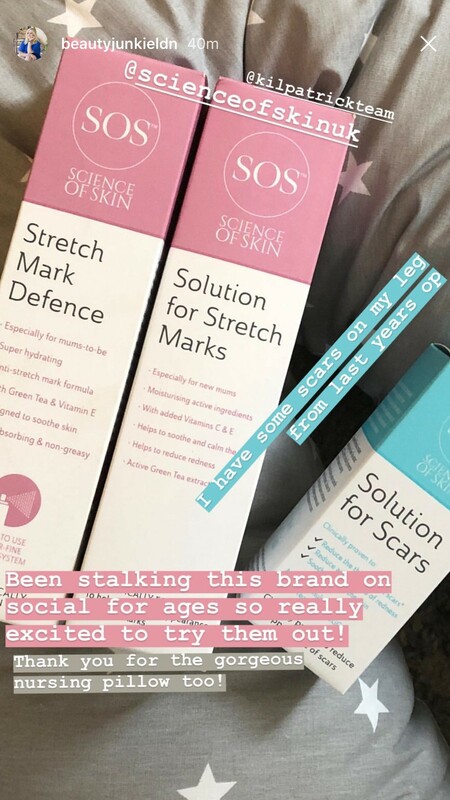 "To feel more confident about your post-baby body, why not try Science of Skin’s Solution for Stretch Marks to tackle any marks left behind after pregnancy. " "do accept his own Solution for Scars ointment that he sends you home with after surgery (it helps with redness and itching)." 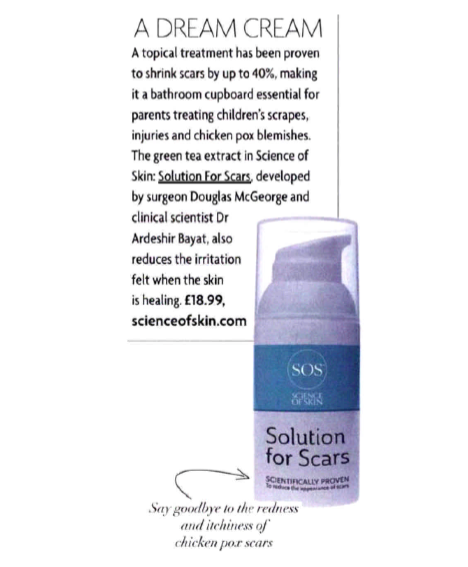 "Solution for Scars improves not only the look but also the symptoms of red, swollen, itchy scars - however old or new they are"
"We've tried it on acne scarring and it's pretty impressive"
"This month's must have gifts and accessories "
"lab tests have shown the cream could reduce the scars by up to 40%"
"Science of Skin would now be my recommended ‘go to’ brand to use to nourish your skin pre and post pregnancy." 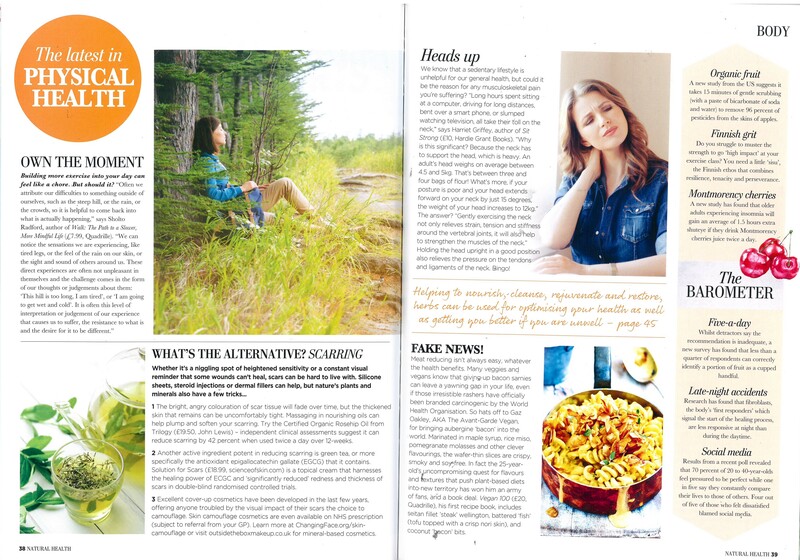 "It helps to reduce the appearance of newly formed scars"
"Mum tells of miracle cream that left her young daughter with extreme chicken pox scar-free"
"Science of Skin develop solution-focused skincare remedies using naturally active properties of green tea extracts." 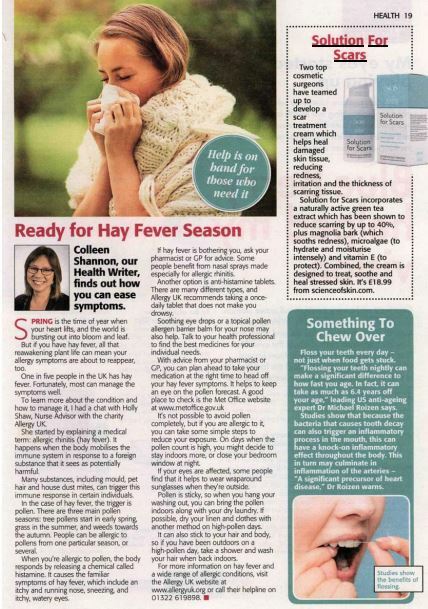 "If you are pregnant, protect yourself from stretch marks with Science of Skin, Stretch Mark Defence"
"Enhances the skin's reparative response, controls irritation and promotes recovery"
"A proven formula that was developed by a UK plastic surgeon"
"A natural proven formula which supports the skin's structure at the first signs of stretching and helps reduce redness, irritation and itchiness"
"Scientists claim they've finally cured stretch marks - with green tea!" 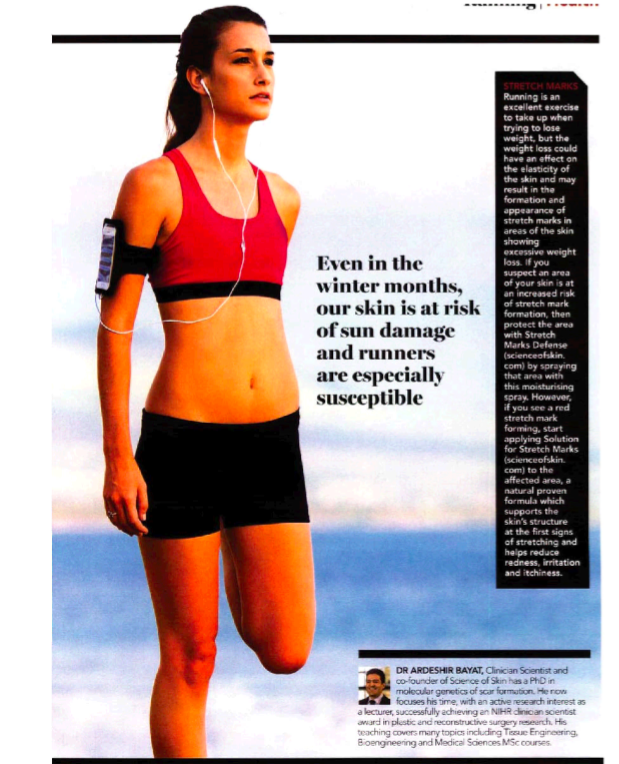 "Recently had an operation and concerned about scarring? " 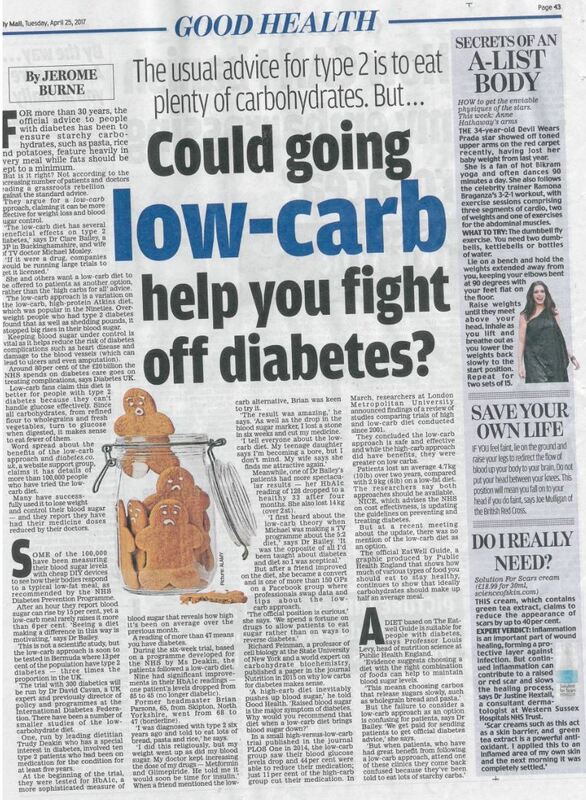 "We have only ever had this result from a cream that cost a staggering £335. This is well worth 40 quid." 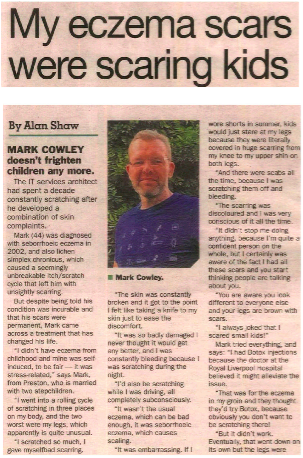 "My eczema scars were scaring kids"
"Plastic Surgeon Turns Back on Silicone World First: New Studies shows effectiveness of natural substance scientifically verified to shrink scars." 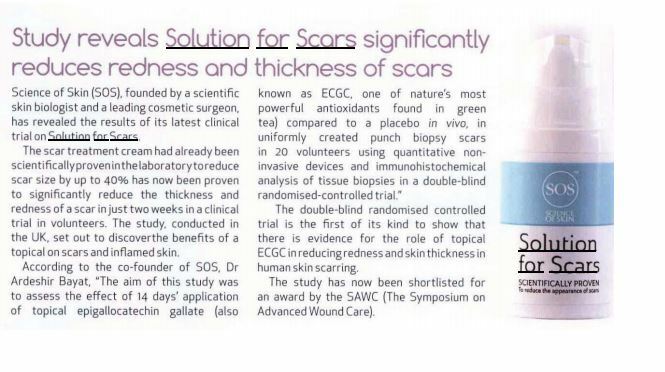 "Solution for Scars aims to minimise scars before they establish." 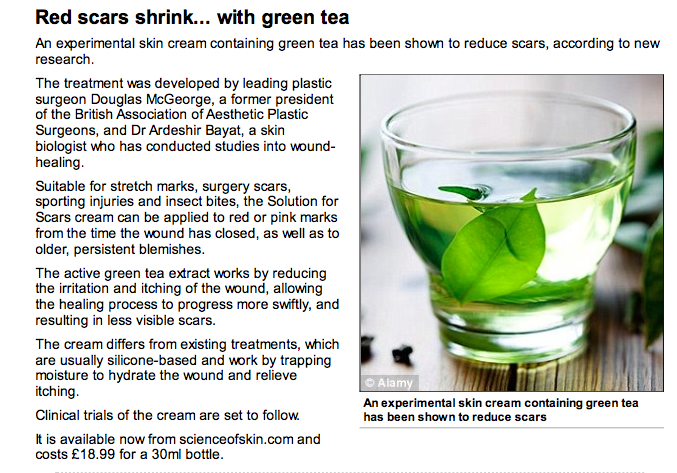 "Scars Shrink with Green Tea"
"Skin cream containing green tea has been shown to reduce scars." 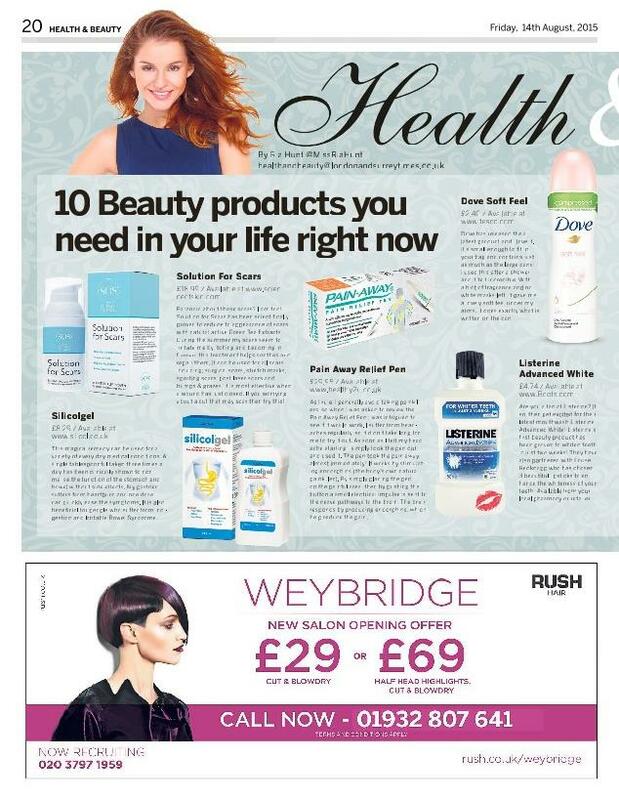 " 10 Beauty Products you need in your life RIGHT NOW." 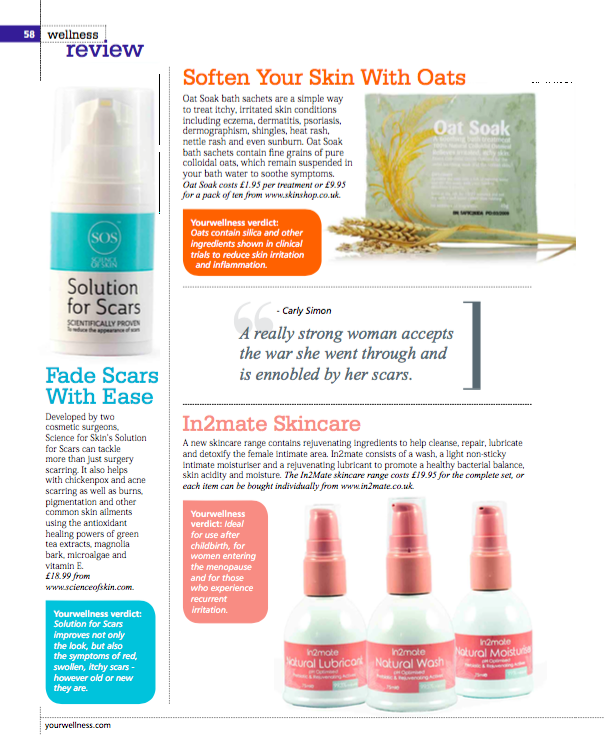 "We just love this new topical treatment for scars, from bumps and scrapes to burns and itchy chickenpox scars."